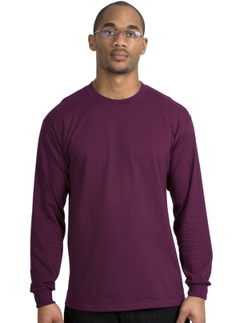 Custom embroidered long sleeve t-shirts, including moisture wicking, mock, garment dyed, tagless and Beefy-Ts. 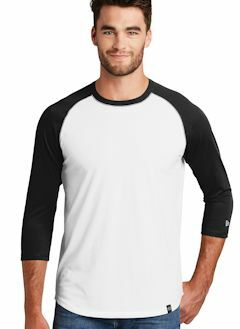 Brands such as Champion, Sport-Tek, District Threads, Anvil, Comfort Colors and Hanes are just a few that fill this custom embroidered lont sleeve t-shirt page. Start with any of these quality styles and add your custom embroidered logo at no extra charge. Perfect to your school, event, athletic outing, team sport or just promoting your business. 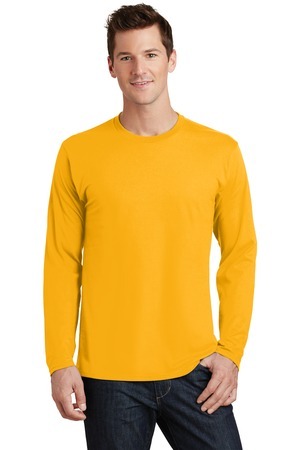 Custom embroidered long sleeve t-shirts are budget friendly and comfortable too. Custom embroidered G840 Gildan DryBlendT 5.6 oz., 50/50 Long-Sleeve T-Shirt . 50% preshrunk cotton, 50% polyester; DryBlend® fabric wicks moisture away from the body; double-needle stitching throughout; taped shoulder-to-shoulder; seamless collar; ribbed cuffs . Custom embroidered logo included. 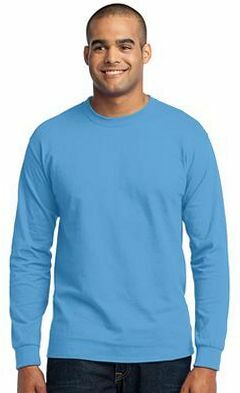 Custom embroidered 29L Jerzees 5.6 oz., 50/50 Heavyweight Blend Long-Sleeve T-Shirt. 50% cotton, 50% polyester preshrunk jersey; shoulder-to-shoulder tape; double-needle stitched; seamless body for a wide printing area; 1x1 ribbed collar; Oxford is 53% polyester, 47% cotton; 1x1 ribbed cuffs. Custom embroidered logo included. Custom embroidered Port & Company ® - Long Sleeve Essential T-Shirt. PC61LS. 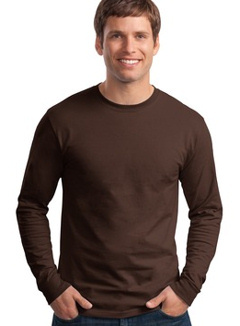 Nothing beats this traditional custom embroidered long sleeve t-shirt in comfort, versatility and casual style. 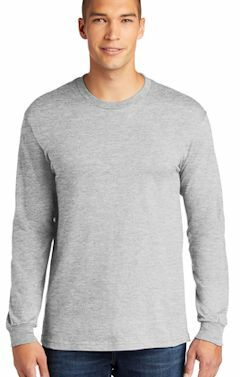 Heavyweight 6.1-ounce, 100% cotton, Coverseamed neck, Shoulder-to-shoulder taping, Double-needle hem, Ash is 99/1 cotton/poly., Athletic Heather is 90/10 cotton/poly. Custom embroidered logo. Tall Sizes Available! Custom embroidered 5586 Hanes Tagless® 6.1 oz. Long-Sleeve T-Shirt. 6.1 oz., 100% heavyweight, preshrunk, open-end cotton jersey. Tagless for ultimate neck comfort. Double-needle coverseamed neck. Shoulder-to-shoulder tape. Set-in sleeves. Rib knit cuffs. (Ash is 99/1 cotton/poly; Light Steel is 90/10 cotton/poly) Custom embroidered logo included. Custom embroidered G240 Gildan Men's Ultra Cotton® 6.1 oz. Long-Sleeve T-Shirt. 100% preshrunk cotton tee (ash is 99% cotton; sport grey is 90/10 cotton/poly). Double-needle stitched neck and hemmed bottom. Taped shoulder-to-shoulder. Custom embroidery included. Custom embroidered Hanes Long sleeve Beefy T Tshirt. 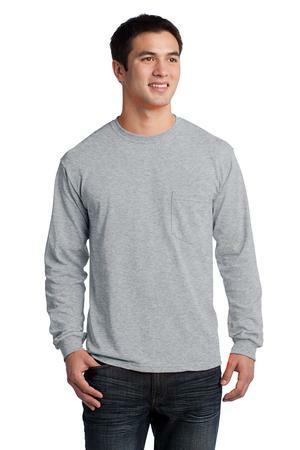 6.1 oz., 100% preshrunk ringspun cotton tee (ash is 99% cotton, light steel is 90/10 cotton/poly). Double-needle stitched cover-seamed collar and hemmed bottom. Ribbed cuffs. Taped shoulder-to-shoulder. Custom embroidered logo included.